Dear Esther will give you the chills, and also attract you with its beautiful, muted landscapes and island of mystery. As you put the pieces together, your understanding of the story seems to become as insubstantial as the visions disappearing before you. The game was first released in 2008 as a source engine mod for Half Life 2. It's since been remade, and debuted on Steam last month (selling 16,000 copies in just six hours). We’ve interviewed game artist and level-designer Robert Briscoe to see what all this fuss is about. Game On: What do you do, and how did you get into the game developing scene? Also, how did you meet Dan Pinchbeck? Robert Briscoe: I’m an environment artist recently turned Indie developer. I’ve been a 3d artist for over ten years now, but only began dabbling in game art back in 2004 when Valve released their SDK for Half-Life 2. I made a couple of DM maps and was eventually recruited into a mod (also recently turned indie) called Nuclear Dawn along with what was some of the most talented people on the Source Modding scene back then. Working with such a talented group really pushed me to improve the quality of my work and I learned a hell of a lot during my time on ND. It was also during this time that I found myself working more hours on my mod stuff than I was with my real Job - but enjoying it a hell of a lot more too! I think that was when I realised that I wanted to do game art for a living, and as soon as my work was finished on the mod, I began looking for a job in the industry. Fortunately, by then, many of the team had already been recruited by various game studios, and since I finally had some decent, relevant work in my portfolio, I used some of my new found connections to eventually land myself a job at Dice as an environment artist on Mirror’s Edge. Mirror’s Edge was another great experience for me – yet again I was working with a group of highly talented individuals who motivated me to not only raise the quality of my work even higher, but also push myself to think more creatively… I think Mirror’s Edge kind of spoiled me in that regard - after it was done I couldn’t really face going back to work on anything more generic, coupled with the fact I was suffering from serious burn-out, I decided to take a year out to recharge my batteries figure out what to do next. Whilst I recharged my batteries I also wanted to take on a little side project to keep my creative juices flowing, I started looking for inspiration on the indie and modding scene and that’s when I stumbled upon Dear Esther – It blew me away! The idea was brilliant, original and inspiring and the quality of the writing and music were already beyond that of most AAA games. The design and visuals were a bit rough around the edges back then though, but I felt that with a bit of polish and care it had potential to be something spectacular. I contacted Dan in 2009 about doing a remake and that’s when I first met Dan. He’s been brilliant throughout the whole project, not only giving me his full support, but he’s also put in a ton of effort into it along the way and without that kind of support a seriously doubt Dear Esther would have ever have come this far. Game On: Describe Dear Esther. How was the game conceived? Robert Briscoe: Dear Esther is a deep, poetic ghost story told using game technologies. You explore a deserted island, uncovering a tale of love, loss, grief and redemption, delivered through a stunning voice-over and soundtrack set against beautiful environments. Rather than traditional gameplay the focus is on exploration, uncovering the mysteries of the island and discovering who Esther is and why you’re there. The idea was originally conceived by Dan Pinchbeck in 2008 and came from the question of what would happen if you stripped traditional gameplay from a typical FPS space, leaving nothing but the story to keep the player engaged, and what kind of experience it would create? Not only that, but how abstract and fragmented could the story be whilst still engaging the player? From my point of view, it was an experiment to see how far it could push the perceived limits of normal FPS play in order to have an original, more engaging experience. Game On: Why should we play it? And why should gamers tap into the indie scene-- and into this game specifically? The Indie scene has so much to offer - there are so many fantastic games that are only possible thanks to the unbound creativity that exists there. Minecraft, Spelunky, Braid, Flow, The Binding of Isaac, etc. Imagine pitching these titles to an AAA Studio or Publisher 5 years ago – you’d have been laughed out of the room! With the bigger studios you’re looking at tens of millions for the cost of an average game development cycle and as a result the innovation is only an iterative thing to offset any chance of failure financially and recouping those costs – this is why franchises are so popular at the moment. With the indie scene you have smaller, more focused teams working on projects where the risk isn’t in how much money it will make, or building a franchise, but how cool it is. I can imagine a lot of biggest indie successes probably just start out with the thought “wouldn’t it be cool if…?” rather than “is this going to be profitable enough?” The Indie scene is now a really big part of the growth of the PC games industry and if people want that originality and creativity to continue on and spread into other platforms and areas of gaming then supporting indie dev’s is the best way to do that! Rocky, lonely landscape of the Island. 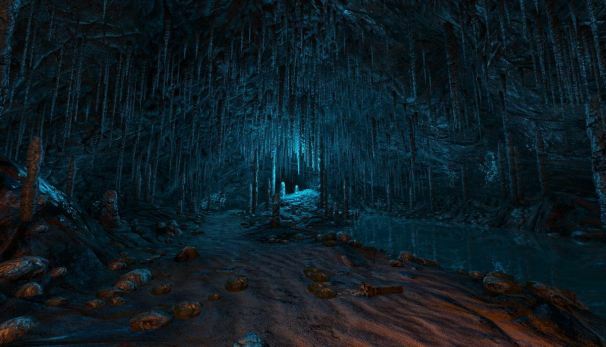 Game On: What tools and training did you employ to create Dear Esther? How long did you spend working on it? Robert Briscoe: As mentioned earlier, I’d had quite a bit of experience in the past with the Source Engine whilst in the modding and mapping scene, and even whilst working at Dice I still dabbled with it from time to time so it seemed a natural fit to use that experience when it came to the remake. When I started the project in 2009, the likes of UDK and Cryengine 3 didn’t exist, and the only viable alternative was Unity, but I really wanted to be able to do as much as possible without touching any code. Source had all the mechanics I needed from the get-go and I figured I could do everything I needed via scripting. It started out as a simple mod, using the standard HL2 SDK base and toolset but I think about 6 months into the project, I started to realise that to really achieve something special I’d have to go beyond the standard toolset, and got in touch with our current coder, Jack Morgan, about doing some minor fixes and improvement to the engine. I quickly realised he was going to be an important addition to the team – especially so when we switched over to the Portal 2 Engine. I think overall I’ve spent nearly 3 years working on it, two of those developing the alpha on the Orange Box SDK and then almost another year porting it to the Portal 2 engine – it’s been a bumpy road to get here, especially considering it started out as a fun little side project that was supposed to take 12 months to finish. Both my finances and my social life have taken a bit of a beating – but I’m hoping it will all be worth it in the end! Game On: What do you think sets Dear Esther apart from other games? Is there anything you wish you could have done differently? Robert Briscoe: Everyone who plays the game will have a unique experience – the VO cues and details in the environment are different on every play through. You might see or hear things that others missed, giving you your own unique insight into the story behind the island. You might even find that your experience contradicts what others interpret the story to be. That’s something I’m most looking forward to – is people talking about what they got out of the game, good or bad, and hearing their own take on the story of Dear Esther. I don’t think I could’ve done anything differently; I’ve pretty much done everything humanly possible to make it something special – I just hope others will think it so too. Game On: What were your projects previous to Dear Esther-- did Dear Esther stray from the path you normally tread? 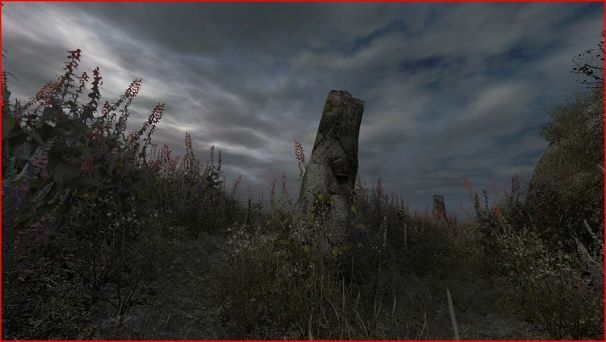 Robert Briscoe: Dear Esther felt a natural progression for me at the time; back when I was still in the mapping scene I found myself becoming increasingly focused on the art and less on the design side of things – I mean, looking back at some of my past mapping efforts for Source, they all looked pretty good, but were really not that great design wise. For me the design was always the boring part of the process and as a result would skip over it as quickly as possible so I could start making it look cool. I found my niche when I discovered Dice were looking for environment artists, who are basically the people that go in and take a basic pre-designed or ‘blocked-out’ levels and turn them into something cool – So I was just basically focusing on the best part! Still, I worked very closely with the level designers at the same time, as it’s a very important part of the process, and by doing so I learned a lot about how art and gameplay can complement each other and how the environment art can actually augment and enhance the player experience rather than be just something pretty to look at. Overall it was an eye-opening experience but I still found myself feeling restricted at times. When I stumbled across Dear Esther I saw an opportunity for the art and the environment to be more than just a backdrop, but to be an integral part of the game – a main character in the story, which I felt had not been fully realised up to that point. I guess from the outside, looking at past games I’ve worked on, it’s definitely a departure so to speak, but for me personally it was exactly what I was looking for! Game On: How do you feel about the Independent Games Festival in general, and this year in particular? What are you excited to do, see and play at the show this year? Robert Briscoe: Extremely excited and nervous! Looking at the quality of some of the other nominees this year makes me feel extremely honoured, I don’t mind losing to any of those guys! Being so broke, I almost wasn’t able to attend this year’s IGF, but thanks to the generosity of my family I'm now booked and ready to go! I'm super excited to go to my first games festival and meet some of the people who have inspired me during this project. Personally I'm really looking forward to seeing more of Botanicula as I love the Samorost games, as well as To The Moon and Fez which I can’t wait to get my hands on! Game On: What might you say to someone eager to dabble in indie game development? Any tips or warnings? Robert Briscoe: If you’re planning on quitting your job and going indie then plan ahead! Make sure you have a solid idea first and ideally have built some kind of prototype that works before jumping off the deep end. Most importantly, make sure you have the financial means to support yourself throughout the project - basically, however long you think it’s going to take to develop your game – double it, and then add on a few extra months for good measure! Same goes for students who’re looking to go indie after they graduate rather than head straight into a studio, it’s a great way to break into the industry, even if you don’t plan on being indie forever, you’ll get some real experience under your belt and possibly even make a bit of money at the same time! Robert Briscoe: Dear Esther is out on Steam now!